The National Community Cups® program will support the mission of the Joy in Childhood Foundation (formerly The Dunkin’ Donuts & Baskin-Robbins Community Foundation) to provide the simple joys of childhood to sick and hungry kids. This is the fourth consecutive year that the Foundation has launched this fundraising initiative and guest support for the past three programs at Dunkin’ Donuts and Baskin-Robbins locations has raised over $1.5 million dollars nationwide since 2013. Celebrating its tenth anniversary this year, the Foundation has been deeply embedded in communities across the country and has donated over $11 million to hundreds of national and local charities. 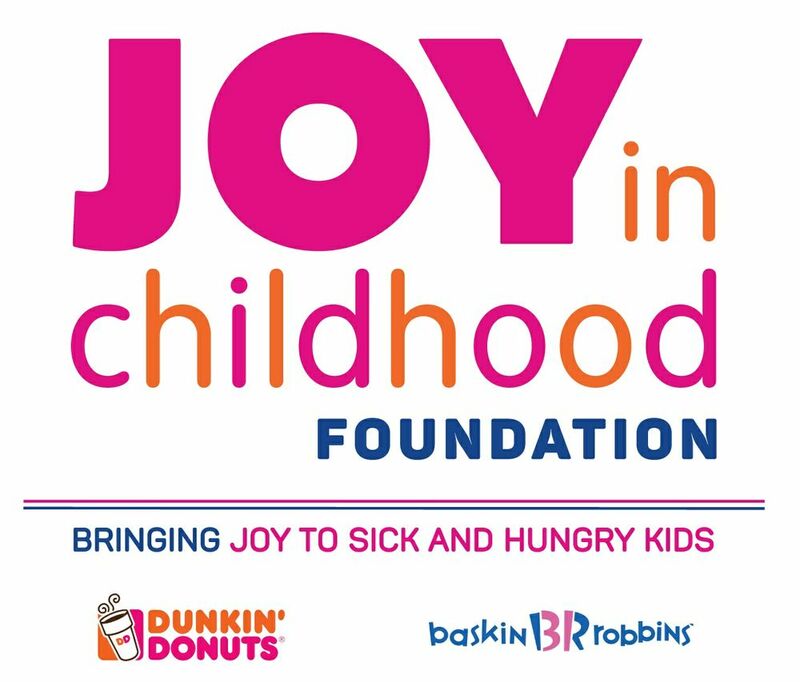 Through the generosity of Dunkin’ Donuts and Baskin-Robbins franchisees, employees, vendors and guests, the Joy in Childhood Foundation raises funds to support partnerships with children’s hospitals, food banks, and nonprofit organizations directly committed to serving sick and hungry kids. In 2015 alone, the Foundation raised $3.4 million, funded 114 grants and charitable partnerships and provided 437,000** meals through grants made to Feeding America. The Joy in Childhood Foundation provides the simple joys of childhood to sick and hungry kids. The Foundation brings together a wide range of stakeholders—including franchisees, crew members, employees, partners and guests —and partners with food banks, children’s hospitals, and nonprofit organizations directly committed to serving sick and hungry kids to fund joyful environments, joyful experiences and joyful expressions to ensure that children whose lives are compromised by hunger or sickness have the support and essential services to find joy in their daily lives. Since launching in 2006, the Joy in Childhood Foundation (formerly The Dunkin’ Donuts & Baskin-Robbins Community Foundation), has granted more than $11 million to hundreds of national and local charities across the country. *Limit one coupon per customer per visit. Dozen donuts exclude Croissant Donuts, Fancies and Squares. Expires 12/31/16. **Meals enabled from June 1, 2015 through May 31, 2016 through grant funds from the Foundation. This entry was posted in Business, Financial, Food & Beverage, Healthcare, Management, Philanthropy, Retail, Retailer and tagged Dunkin’ Donuts stores, Karen Raskopf, November, The Joy in Childhood Foundation's 2016 National Community Cups® program. Bookmark the permalink.